Reproduction Decals is an authorized dealer for Sudco, K&L, All Balls Racing, Wiseco, PMC Inc., Buchanan's Spoke & Rim, Inc., Motion Pro, Badge Replicas, Winners Circle Motorsports, Airtech, and others. We stock thousands of parts for vintage Japanese motorcycles and have access to many more. Hard to find parts for Kawasaki triples. 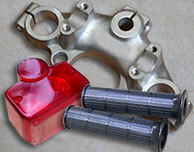 We have a very large selection of parts. Badges / Emblems for vintage bikes. Replacement fuel tank and side panel badges. 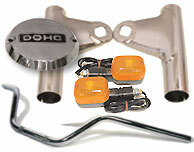 All NOS parts available while quantities last. Reproduction Decals has searched the world, enabling us offer vintage motorcycle enthusiasts a large selection of aftermarket and vintage parts. 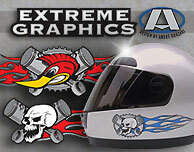 Our exclusive line of graphics designed to fit helmets, gas tanks and fairings, but the only limit is your imagination. Gaskets, lighting, pistons, cables and much more. Too much to list so contact us for pricing and availability. 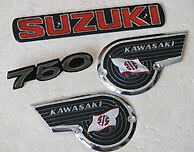 Reproduction Decals is not affiliated with Yamaha®, Kawasaki®, Suzuki®, Honda® or any other OEM. We reprint graphics and labels that are no longer available in the interest of preserving motorcycle history. 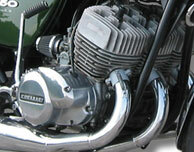 All graphics are reproductions created solely for the purpose of motorcycle restoration. Please check with the dealer to purchase decals for current models. New products are being added weekly. Bookmark us and visit often. All images on this web site are for identification or informational purposes only.